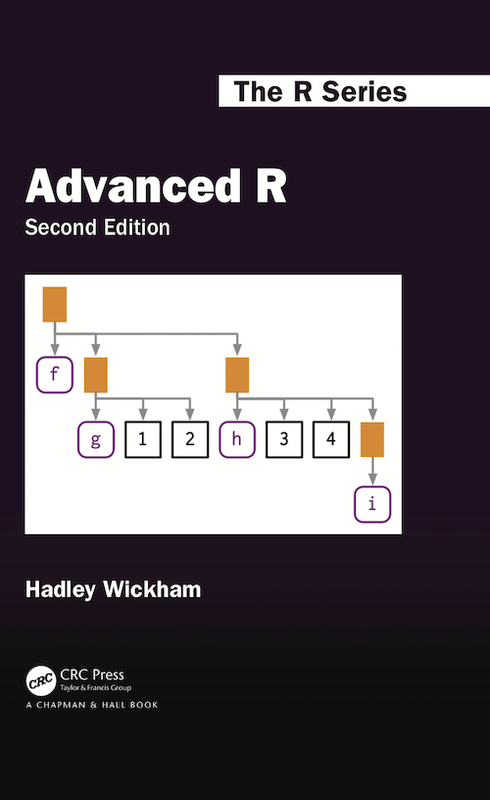 This is the website for 2nd edition of “Advanced R”, a book in Chapman & Hall’s R Series. The book is designed primarily for R users who want to improve their programming skills and understanding of the language. It should also be useful for programmers coming to R from other languages, as help you to understand why R works the way it does. If you’re looking for the electronic version of the 1st edition, you can find it online at http://adv-r.had.co.nz/. This work, as a whole, is licensed under a Creative Commons Attribution-NonCommercial-ShareAlike 4.0 International License. The code contained in this book is simultaneously available under the MIT license; this means that you are free to use it in your own packages, as long as you cite the source. “Advanced R solutions” by Malte Grosser and Henning Bumann, provides worked solutions to the exercises in this book. “R for Data Science” which introduces you to R as a tool for doing data science, focussing on a consistent set of packages known as the tidyverse. “R Packages” which teaches you how to make the most of R’s fantastic package system.